Take Control of Your Trading On-the-Go. 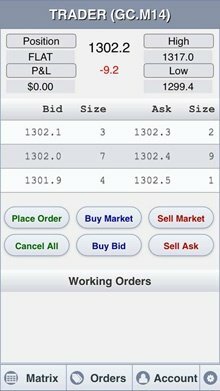 The Firetip | InsigniaTrader MOBILE app is fully synchronized with our Firetip | InsigniaTrader Pro or Basic platforms giving you total control of your trading, at home, the office or virtually any location with an internet or cellular data connection*. Single-click order execution and the patented MD Trader® ladder coupled with tools for automated trading, charting and more give traders the edge for optimal trading performance. Select, track, and trade contracts with ease in the palm of your hand. The Advanced Trader enables you to watch the market dynamics and trade with our customized “One Touch Trading” technology. You can get quotes, watch market movement, trade and view your orders for individual markets, all from the Advanced Trader window. Control your trades simply and nearly instantaneously from the Advanced Trader. Change working orders by touch-and-dragging the order to the new desired price. Liquidate (go flat) all positions with one touch. Reverse positions with a single touch. With one touch, cancel all pending orders. Place limit or stop orders just by touching on the desired price of the market you’re viewing. 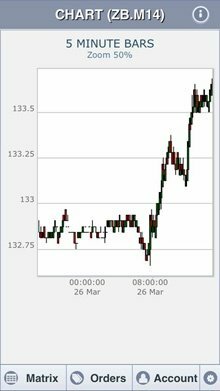 InsigniaTrader MOBILE offers a powerful charting system with numerous indicators and charting capabilities. Add custom trend lines and pointers that support and define your individual trading strategy. Charts fill approximately 80% of the device window for ease of use. Many industry standard indicators are included & customizable such as MACD, Moving Averages, RSI & Stochastics. Choose to display your charts with either traditional Bars or Candlesticks. Choose your charting time frames, from minutes, hours or days. Zoom in and out using typical touch-screen finger gestures. 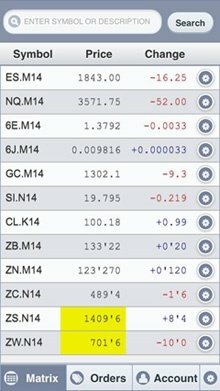 In addition to the Firetip | InsigniaTrader MOBILE platform, a software based platform and a web based version are also included. ** A $0.45 transaction fee may apply for users of the Basic trading platform. “InsigniaTrader” and the above images and information contain trademarks and copyrights of Insignia Futures & Options, Inc. All rights reserved. “Firetip” and the related logos and images are trademarks of Certigo.com.